Robust regression is an alternative to least squares regression when data is contaminated with outliers or influential observations and it can also be used for the purpose of detecting influential observations. This page was developed using SAS 9.2. Let’s begin our discussion on robust regression with some terms in linear regression. Residual: The difference between the predicted value (based on the regression equation) and the actual, observed value. Outlier: In linear regression, an outlier is an observation with large residual. In other words, it is an observation whose dependent-variable value is unusual given its value on the predictor variables. An outlier may indicate a sample peculiarity or may indicate a data entry error or other problem. Leverage: An observation with an extreme value on a predictor variable is a point with high leverage. Leverage is a measure of how far an independent variable deviates from its mean. High leverage points can have a great amount of effect on the estimate of regression coefficients. Influence: An observation is said to be influential if removing the observation substantially changes the estimate of the regression coefficients. Influence can be thought of as the product of leverage and outlierness. Cook’s distance (or Cook’s D): A measure that combines the information of leverage and residual of the observation. Robust regression can be used in any situation in which you would use least squares regression. When fitting a least squares regression, we might find some outliers or high leverage data points. We have decided that these data points are not data entry errors, neither they are from a different population than most of our data. So we have no compelling reason to exclude them from the analysis. Robust regression might be a good strategy since it is a compromise between excluding these points entirely from the analysis and including all the data points and treating all them equally in OLS regression. The idea of robust regression is to weigh the observations differently based on how well behaved these observations are. Roughly speaking, it is a form of weighted and reweighted least squares regression. Proc robustreg in SAS command implements several versions of robust regression. In this page, we will show M-estimation with Huber and bisquare weighting. These two are very standard and are combined as the default weighting function in Stata’s robust regression command. In Huber weighting, observations with small residuals get a weight of 1 and the larger the residual, the smaller the weight. With bisquare weighting, all cases with a non-zero residual get down-weighted at least a little. For our data analysis below, we will use the data set crime. This dataset appears in Statistical Methods for Social Sciences, Third Edition by Alan Agresti and Barbara Finlay (Prentice Hall, 1997). The variables are state id (sid), state name (state), violent crimes per 100,000 people (crime), murders per 1,000,000 (murder), the percent of the population living in metropolitan areas (pctmetro), the percent of the population that is white (pctwhite), percent of population with a high school education or above (pcths), percent of population living under poverty line (poverty), and percent of population that are single parents (single). It has 51 observations. We are going to use poverty and single to predict crime. In most cases, we begin by running an OLS regression and doing some diagnostics. We will begin by running an OLS regression. 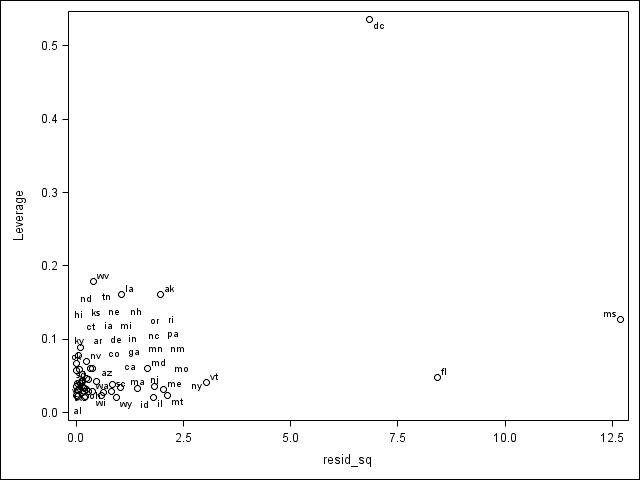 We create a graph showing the leverage versus the squared residuals, labeling the points with the state abbreviations. To do so, we output the residuals and leverage in proc reg (along with Cook’s-D, which we will use later). As we can see, DC, Florida and Mississippi have either high leverage or large residuals. We can display the observations that have relatively large values of Cook’s D. A conventional cut-off point is 4/n, where n is the number of observations in the data set. We will use this criterion to select the values to display. We probably should drop DC to begin with since it is not even a state. We include it in the analysis just to show that it has large Cook’s D and demonstrate how it will be handled by proc robustreg. Now we will look at the residuals. We will generate a new variable called absr1, which is the absolute value of the residuals (because the sign of the residual doesn’t matter). We then print the ten observations with the highest absolute residual values. Now let’s run our first robust regression. Robust regression is done by iterated re-weighted least squares. The procedure for running robust regression is proc robustreg. There are a couple of estimators for IWLS. We are going to first use the Huber weights in this example. We can save the final weights created by the IWLS process. This can be very useful. We will use the data set t2 generated above. We can see that roughly, as the absolute residual goes down, the weight goes up. In other words, cases with a large residuals tend to be down-weighted. We can also see that the values of Cook's D don't really correspond to the weights. This output shows us that the observation for Mississippi will be down-weighted the most. Florida will also be substantially down-weighted. All observations not shown above have a weight of 1. In OLS regression, all cases have a weight of 1. Hence, the more cases in the robust regression that have a weight close to one, the closer the results of the OLS and robust regressions. Next, let's run the same model, but using the default weighting function. Again, we can look at the weights. We can see that the weight given to Mississippi is dramatically lower using the bisquare weighting function than the Huber weighting function and the parameter estimates from these two different weighting methods differ. When comparing the results of a regular OLS regression and a robust regression, if the results are very different, you will most likely want to use the results from the robust regression. Large differences suggest that the model parameters are being highly influenced by outliers. When using robust regression, SAS documentation notes: "estimates are more sensitive to the parameters of these weight functions than to the type of the weight function". However, different functions have advantages and drawbacks. Huber weights can have difficulties with severe outliers, and bisquare weights can have difficulties converging or may yield multiple solutions. As you can see, the results from the two analyses are fairly different, especially with respect to the coefficients of single and the constant (_cons). While normally we are not interested in the constant, if you had centered one or both of the predictor variables, the constant would be useful. On the other hand, you will notice that poverty is not statistically significant in either analysis, while single is significant in both analyses. Proc robustreg does not address issues of heterogeneity of variance. This problem can be addressed by using proc surveyreg. Details can be found in this SAS Code Fragment. The examples shown here have presented SAS code for M estimation. There are other estimation options available in proc robustreg: Least trimmed squares, S estimation, and MM estimation. See the SAS documentation for when and how these alternatives are preferable. Li, G. 1985. Robust regression. In Exploring Data Tables, Trends, and Shapes, ed. D. C. Hoaglin, F. Mosteller, and J. W. Tukey, Wiley. Chen, C. 2002. Robust Regression and Outlier Detection with the ROBUSTREG Procedure. Proceedings of the 27th SAS Users Group International Conference, Cary NC: SAS Institute, Inc.